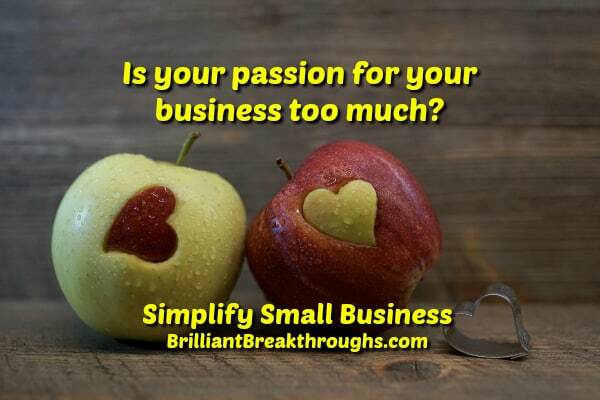 Your passion may be harming your small business success - Brilliant Breakthroughs, Inc. YOUR Business needs YOUR Passion to survive. When does it become too much and harmful? Ready for this? YOUR passion for what you do, may be the one thing that’s holding YOUR Small Business’s Success from being attained. Yes, you read this correctly. Passion is good for Small Business Owners (SBOs), but there’s a threshold as to how much is helpful versus harmful! Where are you in YOUR Passion Spectrum for Small Business Success? Now, go through each point of YOUR Passion Spectrum for Small Business Success. Give yourself a score, between 0 -10, for both Help and Harm. Take a moment to do it now. Did your score reflect YOUR Passion is both helpful and harmful to YOUR Business’s Success? Most likely, the answer is yes. Don’t worry, the answer should be yes because all SBOs should allow their passion to be alive – it inspires! Quite honestly, it helps you survive the really challenging days, doesn’t it? TIP: Don’t kill the strength of YOUR Passion – you need it. Instead balance it with the other business activities you must be doing – whether you like them or not. SBOs, begin today by experimenting with shifting your activities and priorities to better serve YOUR Small Business’s needs. If you do this now, you’ll quickly see the reward of YOUR Business’s Performance better supporting YOUR Business’s Vision. Please feel free to share a question or insights in the comments section. What’s your greatest challenge to improve your profitability right now? p.s. : Improving business profit doesn’t have to be difficult, start by learning how to balance your passion for greater success!